Members play a crucial role in 171 Cedar Arts Center’s past, present, and future. Our mission is to enrich the community by offering superb, professionally taught classes, a fascinating array of art, and the chance to participate. As a member, you help us fulfill this mission and are a valued and essential part of an organization at the center of the regional arts scene. Support from loyal patrons through membership is essential, since programming revenue covers less than half of our costs. Your membership ensures that 171 Cedar Arts Center remains a thriving organization in Corning and the Southern Finger Lakes region—an area that is renowned for inspiring inclusive arts communities and nurturing progressive and creative individuals. Your membership enables us to provide important programs that encourage self-expression through participation in the arts, regardless of gender, age, or financial situation. Whether you wish to immerse yourself in the arts, or dabble with creative ideas every now and then, 171 Cedar Arts Center can spark your imagination—thriving and contagious—right here at home. Convenient, automatic, ongoing monthly contributions you can change or stop anytime! Make a big impact! 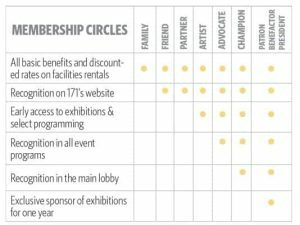 A sustaining member makes a monthly contribution to 171 Cedar Arts Center at whichever membership level is right for you. 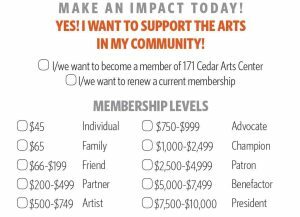 It is the most convenient and efficient way to support programming while maintaining your 171 Cedar Arts Center membership status. How it Works: Your contribution is deducted automatically from the debit or credit card of your choice every month. Your membership renews every year at the same amount. You can make a change or cancel at any time. You will receive an email confirmation for your records each time a payment is processed. Sustaining members receive all of the benefits of regular members based on their level of giving. A Place for Everyone. A Place to Explore! Since first opening our doors in 1968, 171 Cedar Arts Center has provided the community with a warm, friendly home in which to explore the arts. Over the years, with the help of our supporters and our outstanding faculty, we have grown into an award-winning organization that provides top-quality programming and instruction. Even with our growth we are proud that we have preserved a distinct, hometown feeling that makes access to the arts comfortable for everyone. Every year, thousands of people, from toddlers to seniors, explore the arts through classes, lessons, performances, recitals, exhibitions, and much, much more. We invite you to join us. Come to classes in almost every artistic discipline. Wander through one of the ever-changing exhibitions in the Houghton Gallery, or sit down to a performance in the Studio Theater, where artists reach you on a more personal level. Classical to contemporary. Observe or participate. With so many choices on one campus, you can choose what really inspires you.